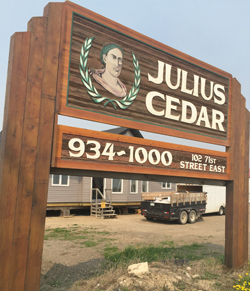 Julius Cedar is the place to go to find the best cedar and lumber products at the best prices in the Saskatoon area. We specialize in quality materials for fences, decks, saunas, gazebos, and so much more. Our knowledge and experience will allow you to realize your project goals. At our showroom, we have a great selection of stains, gate hardware, and cedar products to help you envision your completed project.